AKRON, Ohio (CNN) -- George W. Bush tried to turn aside more questions Friday about whether he has used illegal drugs, saying the message for the "baby boom" generation to send their children is: "Do not use drugs." Bush Thursday denied using illegal drugs over the past 25 years, but refused to discuss his younger years for fear of sending "a signal to children that whatever I may have done is okay." When reporters raised the issue at another campaign stop Friday, the Texas governor said, "I think parents, particularly baby boomer parents, ought to say to children do not use drugs. I think we owe the children that responsibility to share our wisdom. I worry about a society that sends a different message. "One of the interesting questions facing baby boomers is have we grown up? Are we willing to share the wisdom of past mistakes, and I think the message ought to be to all children, don't use drugs and don't use alcohol. That's what leadership is about." Since Wednesday, Bush has been peppered with questions about drug use after he was asked in an interview with the Dallas Morning News whether he could pass a background check for federal employees. That check has a question asking prospective appointees if they have used illegal drugs within the past seven years. Bush said he could pass that exam. On Thursday, he said he could have passed a background check when his father began serving as president in 1989. 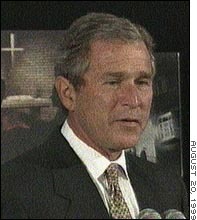 Later, an aide clarified the remarks, saying Bush has not used illegal drugs in at least the last 25 years. "I've told the American people that years ago I made some mistakes. I've learned from my mistakes and should I be fortunate enough to become president I will bring dignity and honor to the office," said Bush -- his consistent response to repeated questions about whether he ever used illegal drugs. Bush has been more specific on other mistakes from his past. For example, he has admitted to past drinking problems. He also has complained that some of the rumors have come from opposing Republican presidential campaigns. In an interview Thursday on CNN's "Inside Politics," GOP presidential candidate Steve Forbes said such a "plant" had "absolutely not" come from his campaign. When asked whether he would ask Bush the drug question in a debate, Forbes responded, "That's a question you guys have asked. I'm not going to ask it." So far, the question does not seem to be hurting Bush in the polls. A TIME/CNN poll of 344 Republicans nationwide taken Thursday show 56 percent prefer Bush as the GOP nominee. The only other candidate in double digits is former Red Cross Chairwoman Elizabeth Dole with 12 percent. That number is virtually unchanged from Bush's 57 percent showing of a month ago. Perhaps even more importantly, only 11 percent of all voters polled -- and only 9 percent of Republicans -- feel that proof of cocaine use in his 20s should disqualify Bush from serving as president. A resounding 84 percent of voters and 87 percent of Republican voters felt just the opposite -- that they did not feel proof of cocaine use in his 20s should disqualify Bush. The poll also indicates 71 percent of Republicans polled think Bush will be the GOP nominee, with Bush the only candidate to finish in double digits on that question. The Texas governor is the only major presidential candidate who has not answered the question about whether he has ever used cocaine. Several other presidential candidates, including Vice President Al Gore, the Democratic front-runner, have admitted to past marijuana use.